When Banyuwangi tour package is famous with a tour to explore Red Island, Baluran Savannah and Ijen Crater, going for a traditional custom ceremony in Banyuwangi must be something new. Nowadays, cultural attraction like a ceremony of Seblang tradition has become an object of interest by a lot of tourists who visit Banyuwangi. Then, How about you? If you are interested to learn more about the local culture as you visit Banyuwangi, combining your Banyuwangi tour package with a trip to spectate Seblang ceremony will be a perfect choice. Among some other custom ceremonies practiced in Banyuwangi, Seblang is for sure one of the most unique that you shouldn’t miss. And here are some other reasons why you should watch it. 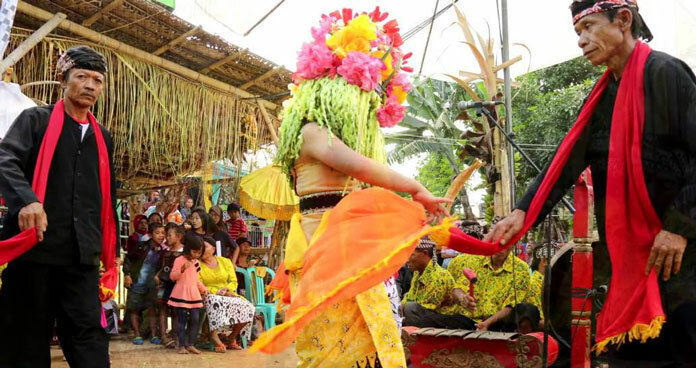 It’s no doubt that Seblang ceremony has become one of the most awaited events in Banyuwangi that is held annually. Since it is only held once every year, you must make sure that your Banyuwangi tour package is booked during the event which is going to be conducted in a week during the first week of the Javanese Month of Syawal. Seblang Ceremony is characterized by a traditional Seblang dance which is performed by a virgin girl. According to the local belief, the chosen dancer to perform Seblang dance is possessed by astral creature, so she is dancing while in trance condition. We can say that you won’t be able to find this unique performance with another Banyuwangi tour package. Seblang dance is nothing like a dance only. Overall, it shows a great performance. The dancer is dressed beautifully unique and there is a Gamelan music accompanying the dancer who is dancing around the Seblang arena. Along with the dance and music performance, some Osing woman will read Gending in Osing language. You can’t deny that it will be your best Banyuwangi tour package. This traditional custom ceremony is intended to keep the society away from bad luck. It is symbolized by the dancing movement of Seblang dance. The name of Seblang itself is derived from Sebele Ilang which means the bad luck has been casted away. There is no doubt that combining your Banyuwangi tour package with this will help you learn more about Javanese culture. Those are several reasons why you must consider booking your trip package to Banyuwangi during the schedule of Seblang Ceremony which takes place on the first week of Syawal Month. After enjoying this exceptional ceremony, you can still explore the other tourism attractions in Banyuwangi as well. So, your Banyuwangi tour package will be richer on fun activity. Now, it is the perfect time to find the best tour provider that makes sure you get the most of your time in Banyuwangi. Without too much talking, there is a recommended provider that you can find on www.jogjabromotour.com. This provider offers custom and private tour to Banyuwangi that you can count on. So, don’t forget to book your Banyuwangi tour package only on www.jogjabromotour.com!